Decisions are not made with our minds they are made with our hearts. As a business person one of my favorite leadership theorists is Simon Sinek. He wrote a book, and more importantly did a TED talk about his book, “It starts with why.” (My hero) He suggests that the part of our brain that controls our decision making is actually the emotional part of our brain, rather than the rational part of our brain. He suggests, and I believe, that starting with why is what creates inspired marketing and for me, in my career and in my own heart, I know that to be storytelling. But this isn’t just for marketers it applies to people. Have you ever had the moment where something creeps over you and while everything rational points in one direction, you make the opposite decision for another reason you can’t quite put into words? You have experienced the why. Today, of all days, this sinks deep within my soul. The why for me is powerful. It is my North Star. It reminds me that I follow my instincts and make decisions in my heart that sometimes I don’t even know I have made. 5 years ago today, my water broke unexpectedly with Q and E at 28 weeks and 2 days. I flash back to the moment 7 months before while on Valium when I told my Doctor, “put 2 eggs in.” I was playing the odds but something else told me it was the right thing to do, 2 eggs. There are so many reasons it may not have worked. It almost didn’t, but then it did. Two amazing babies. 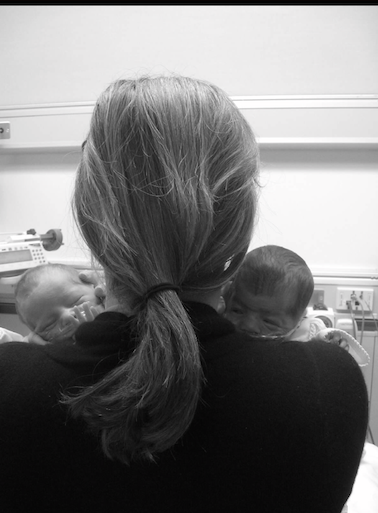 Two tiny miracles marking their place on this earth to change the course of our lives forever. Two people my heart made the decision for before my head even knew what was happening. A couple of nights ago, I had a conversation with a friend about what defines success in life. We landed on success means different things to different people. In work some might define it as a certain level of achievement, and some others might say, doing what you love. In life, we might say, understanding your purpose or leaving the world a better place. But no matter what, I believe, that often we make the choices for what success ultimately means for us long before our head catches up. We make the decision, put it to the universe, whether in a purposeful way, or in a more casual toss, but no matter how we make it, it sets off a chain of events. For me, where I am in life and work largely follows this train of thought. I am not taking away from faith but suggesting that it all works together. The conspiracy often starting long before the acknowledgement of choice. While, 5 years ago I would not have chosen the chain of events, I have always seen the silver lining of my initial foray into motherhood through the wise words of a dear friend who also had her twins very premature, which were, I got extra time to spend with my babies. Some people wait 10 months, I waited 7. I would have not chosen the events but I also know somewhere a long the line, I had made a decision that my life should have purpose and from that moment the Universe conspired to give time just that and on October 16th, 2009 that journey began in earnest. It has been the single hardest and yet most hopeful, joyful, wonderful period of my life. For all of us being challenged by a new experience today, perhaps in its difficult and scary packaging lies that decision you made somewhere in your heart some time ago. It is only now that the universe has conspired to deliver the moment that changes everything. And, while we don’t know the outcome, this moment will alter the course of our lives to offer something so very amazing we would have never experienced it if given the rational decision-making capability. Yesterday was difficult across the board, so much swirl of sadness, moments of change for so many dear to me and for me as well. But today, October 16th, 2014, I look back over 5 years ago in awe of my decisions and look forward with gratitude of knowing those decisions now allow me to make each day “mynewfavoriteday.” I hope you will find the same peace in yesterday, today and tomorrow.